Cisco Umbrella is a cloud-based security platform at the DNS (domain name system) layer that provides the first line of defense against threats on the Internet by blocking requests to malicious destinations (domains, IPs, URLs) before a connection is established. It provides protection against threats over all ports and protocols, and can protect Internet access across all devices on Your network, all office locations, and roaming users. Cisco Umbrella Investigate provides access to certain Cisco Threat Content about malicious domains, IPs, networks, and file hashes. Using a diverse dataset of billions of daily DNS requests and live views of the connections between different networks on the Internet, Cisco Umbrella Investigate applies statistical models and human intelligence to identify attackers’ infrastructures. 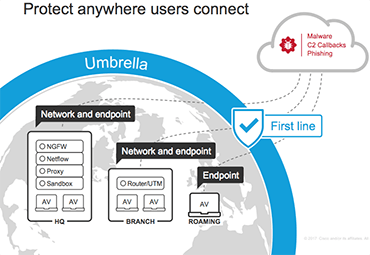 Cisco Umbrella Investigate data can be accessed via a web-based console or an API. Cisco Umbrella includes various license options including Roaming, Branch, Professional, Insights, Platform and Investigate and WLAN. Please consult the Umbrella Documentation for further information on its technical specifications, configuration requirements, features and functionalities. Reseller must be a Registered Cisco Partner with "Cloud Collab Reseller" authorisation to place these orders.